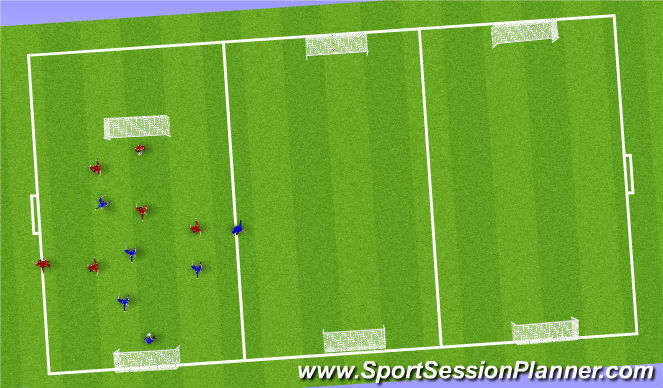 This is a simple heading session were one person has the ball in his hands and his parteners will take turns of running towards him and recieve the ball towards their head and he will head it back towards his partners hands. After this he will retract to the starting position and then go again. Whilst doing this he will be encouraged to perform a jump up and using his neck muscles head it back strongly. Also to add the game like effect the player will be asked to shout his name. When the whistle is blown they will change the thrower. This time the two recievers will be competing between themselves to win a header aiming to head it back to their partner. Taking from what they have been encouraged to do in the first stage, they are taking it into a game like situation by shouting there name as they compete for the ball. After each challenge for the ball the will retract to the starting position as before. Again when the whistle is blown they will change the thrower. small sided game of head catch. Can only score with head and pass with hands. Must had 5 passes before they are aloud to score. Players on the outside can run up and pass the ball back to the team that passed to them. 5 a side 2 on the outsides. pitches x3 When the whistle is blown the person on the outside will change. Each player will be given a number and will take turns on the outside.